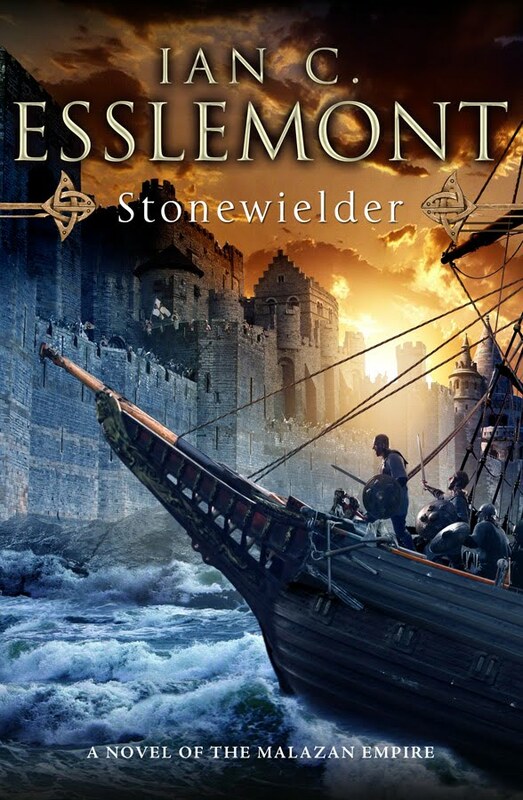 While waiting for the release of the Crippled God - the last book in the main Malazan Book of the Fallen series - I picked up on Esslemont for my Malazan fix, and I'm very glad to say that Stonewielder has completely subverted my expectations. Esslemont's two previous novels in the Malazan world had a couple of problems, but in writing Stonewielder, it's obvious that he's become a much better writer, even rivaling Erikson. Stonewielder takes on what's only been mentioned in the main Malazan series, although Esslemont has visited it briefly before: the subcontinent of Korel. Dominated by the worship of a goddess hostile to magic and the Warrens, the Blessed Lady, Korel has become the target for another Malazan invasion ordered by the new Emperor. It's an interesting setting, and Esslemont fleshes it out capably, bringing it into vivid life far better than he could the areas already explored. As well as the Malazan invasion, however, there are other concerns in Korel, and Esslemont follows these as well: a magistrate investigating a series of murders (seemingly linked to the Lady's worship), the Army of Reform attempting to end the goddess' religious monopoly, and the fight of the Stormguard against the relentless attacks of the Riders, which threaten to drown the subcontinent beneath the ocean. These all make for far more interesting and varied plotlines that the fairly cliched threads of Return of the Crimson Guard. Oddly enough, the only plotline where Esslemont falters is with the Army of Reform, which seems strangely pointless: there's very little fleshed out of the new religion motivating the uprising, or of its leaders. Characters that previously seemed one dimensional also get development as well: chiefly Kyle. He's become less a stereotypically pious character than he was in previous books, and serving as the Adjunct to Greymane, he gets into fights that are far less easily won - the tension is high, and Kyle is not always successful. This, to me, is part of what makes this novel far more interesting fare than the ordinary. One of our other main protagonists, Greymane, also counteracts the typical fantasy stereotype: a commander forced to make lethal decisions and who suffers because of them, Greymane is an antithesis to the 'author's darling' which many fantasy protagonists seemingly represent. Overall, I'd highly recommend Stonewielder: there are some flaws in the plot (particularly regarding the end of the novel), but it's unclear if these holes will simply be filled in through a later novel, as the Malazan universe has always been confusing. It's far better than Esslemont's previous novels, and manages some interesting dilemmas. The Lady in particular is an interesting goddess, and a change from Erikson's own deities. It's well worth reading just for the worldbuilding! Thank you very much! :) Thanks for the link as well - I really like your blog and I'm now following. On Take Free Bitcoin you may claim free satoshis. Up to 22 satoshis every 5 minutes. Did you think about picking the best Bitcoin exchange service: YoBit.